If you haven't started thinking about this important mailing day, you're in luck. We're here today to provide you with some tips to get your Black Friday planning started on the right foot. 1. Check your results: Go back through your old email marketing campaigns and see where you had the most success during the year. It's likely that your target demographic is still the same and is interested in similar deals/product offers. 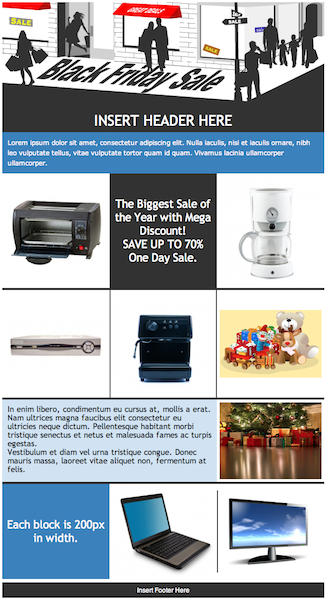 Your email marketing statistics from last year's holiday sales can be very useful as well. Sit down with all of the information and use it craft the best email you can for this year. 2. Get some inspiration: Because Black Friday is such an important day for most retailers, there are often many creative advertising campaigns that go out every year. Gather up your creative team and pick out a bunch of your favorites from years past and see if you can draw some good creative mojo from the success of others. Don't be afraid to take a few risks, consumers expect a bit of flair around the holidays and Black Friday is known for being intense and a bit extreme. Every year we see videos of shoppers running to get the best deal on some popular item, use the excitement of the season to your advantage! 3. Consider a follow up strategy: Just putting together an advertisement may not be enough to get the most out of your sales on Black Friday. There are ways to follow up with list members that may increase your chance of success. Because you'll have open and clickthrough statistics in relation to your campaign, you will be able to target those groups with further offers or incentives. A list member that opened your email, but didn't click through might have been on the brink of a sale. If you contact them with an improved or new offer, you might secure their purchase. Sometimes its preferable to follow up with list members who didn't open or clickthrough with a different or "last chance" offer. Admail.net provides all the tool necessary to take all of these steps and create a fantastic Black Friday email marketing campaign. We also have email templates created specifically for this and many other specific events. Check out some of our brand new template designs here.